I’m just back from a food-tasting event with the good folks from Flip Leaf Communications. This time we brought our taste buds to Pasta De Waraku – Square 2 at #01-07 (Behind Novena Square). The brand Waraku has been in Singapore for 14 years and most folks would have heard of it or dine in one of their outlets at least once. Waraku casual dining is one I am most familiar with as there is an outlet at The Central@Clark Quay near my former place of work. It was also one of my favourite lunchtime venue. Pasta De Waraku is an incarnation of Waraku that focuses more on pasta based dishes. So when there was a holler to try them out at Square 2, it was a chance for me to assess if standards have dropped since I had not been in a Waraku outlet for more than a year. As you can tell from their menu, prices of their mains are in the mid-range, hovering between $15 to $20 all in per person. The value lunch set, which is cheaper, is an attractive proposition. First to arrive at our table was the Waraku Pizza with Tartar Sauce. As you can see, it’s a thin crust pizza with chunky ingredients of fresh prawn, broccoli, tomato and chicken sausage. Cleverly, a sprinkle of tuna is added in the centre, so that when you eat it in slices, assuming you start from the pointy end, you get an appetizing salty bite before you work your way towards the rest of your pizza slice. It works very well. Available in 2 sizes, (M) $15.80 – 4 slices (R) $17.80 – 6 slices, one can easily polish up the larger size. You wish it was bigger. Next, we had the Yakiniku BBQ pizza. It was a smaller (M) size compared to the larger (R) sized Waraku Pizza with Tartar Sauce. Drenched in savoury sauce, the beef was moist and a mix of fine tendon and meat. Dry seaweed added a contrasting texture to the beef, and instead of soaking up the sauce, it deceptively allowed the sauce to drip down my fingers. Not that I’m complaining. My fingers just became finger-licking good. Then, the BIG surprise. Cakes. Were they Japanese cakes, as I had expected? Nope. French cakes. No kidding. Gateau Maison had specially teamed up with Waraku to introduce premium cakes to Singapore. As explained to us, these premium cakes are made with ingredients imported from France. 11 different multi-layered cakes are available, designed by a dedicated culinary team helmed by a pastry chef extraordinaire trained in France. And hey, he’s Singaporean! We sampled 3 different flavours. First, the Aigre, comprising Joconde Sponge, Almond Dacquoise, Chocolate Sponge, Dark Chocolate Mousse and Lemon Coulis. Next, the Fraisinette, layered with Vanilla Sponge, Fresh Strawberries, Blueberries and Fresh Dairy Cream. And finally, the Anushka, layered with Almond Dacquoise, Mango Mousse, Mango Filling and Fresh Mango. I shall keep it short. All 3 cakes shared the same attributes. Classy, well balanced, delicious and I dare say, better than any cake I have tasted by far. At $8.50 per slice, it certainly commands a premium. To get more bang for your buck, it’s better to go for the entire cake priced between $65 to $85 for that special someone or occasion. My only gripe is that despite paying premium price for a premium delicious cake, delivery is not included. Additional charges apply. To save on delivery, opt for self -collect at Pasta De Waraku – Novena Square 2 and maybe you’ll get a bonus kiss from the lucky recipient when you reveal that you personally went to collect the cake. Now that would be the icing on the cake, wouldn’t you agree? Click the logo below to check out their cakes! What do you do when you have free time? You try new things right? That was actually the only answer I would accept. If not, I would simply have gone for a swim instead. Not gonna trade basic integrity for free food tasting. Located at 3B River Valley Road, #01-17/02-02 Clarke Quay, it’s common to walk pass the huge neon sign and shrug it off. This is because the outlet is actually located upstairs while the street level floor looks empty. One might feel too intimidated to scale the stairs up. Is it a beer trading house upstairs? Or maybe a pirate den? Fret not. Climb on-board and welcome to Beer Market. We were greeted by Operations Manager, Charlie, a very jovial chap who led us to a window table. It was 515 pm, the best off-peak time to taste food! We had to start with the beer of course, Beer Market being Beer Market! While waiting for the beers to be served, we saw something new available. Charlie explained that once served only to drivers and the racing crew of F1, the specially formulated F1 Redbull drink is now available at Beer Market, paired with Gin. We did not get a chance to try it but if you want extra large wings to fly, this might just rock your boat. Beer Market has very intriguing beers indeed! The following pictures are just the tip of the iceberg. I shall not give the game away and leave it to you to explore when you hop on down to Beer Market. The good thing about beers served in Beer Market is the low alcoholic content, ranging from 4.3 to 6.7%, thereabout. It means you can try a whole variety of beer without getting knocked out cold in weird compromising positions and risk appearing on STOMP. One thing about flavoured (craft) beer is not to think that when you drink say, Honey Beer, you are going to drink a sweet beer that taste like honey. Don’t take it literally all the time. Think about the scent of honey in the beer, the aftertaste and how it makes you feel at first sip and beyond. That is how it should be, a discovery of how your senses react to your beer. After the round of beer, we proceeded to the seafood shooters. Comprising 3 pairs of shooter glass (2 salmon based), (2 prawn based), (2 crab meat based), they taste yummy in their own rights. The idea however is not to gulp them all down. After countless experimentation, the creative brains at Beer Market have paired the shooters with Tiger Radler, a combo of beer and lemon juice. 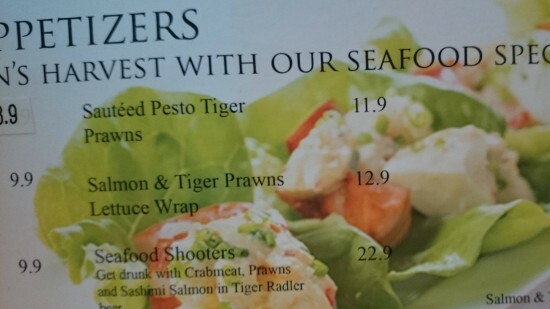 After you down a salmon based shooter, pour the Tiger Radler into the second salmon based shooter and slurp it up like a cocktail. You will get a new sensory experience. As Charlie puts it so well, this is how you drink your food! Oh, we also sampled Beer Market’s Midori – a sweet, bright-green-coloured, muskmelon-flavored liqueur. A very delectable drink! Next, we tried the Salmon and Tiger Prawns Lettuce Wrap. Light, flavouful and tantalizing fresh, it gives you a kind of after-breeze zen. What was worth mentioning is that it looked exactly like its photo on the menu. That’s integrity. What you see is what you get. Full credit has to be given to Chef Steven and team for coming up with these dishes. The midnight seafood rice is a blend of squid ink with well cooked fried rice and a sunny side up egg, a departure from the usual squid ink pasta. Help yourself to the trail of special sauce along the rim of the plate to elevate the yummy level of the dish. The chicken rice pizza is a showcase of how fun food can taste delicious. I thought I would see slices of hainanese chicken on the pizza even though I could not fathom how it could actually blend successfully with pizza crust. Cleverly, the basic structure of a pizza is retained with careful infusion of flavoured rice and a sprinkling of meat. The salted egg pizza was a great balance of salted egg without going on a salt overkill. The crust tasted biscuity and I found myself happily munching on non-stop. I don’t know how the folks do it but it’s a winner to me. If you are an oyster fan, you can have really fresh oysters from Sydney, Australia, shucked right before you (By who else but the guy you see in the pamphlet). Those who know me know that I avoid oysters with a vengeance even at expensive buffets. I can’t explain what happened but I actually popped one into my mouth! Fresh and not as “fishy”, the texture is slimy but I can taste the ocean in my mouth. For those fresh oysters fan, they are yours at 3 for $10. Beer Market has a good vibe about it and as the crowd started to pack the place at about 730 pm, you see a more local crowd. So don’t feel intimidated Singaporeans! You are among your own kind here. Of course we love our foreigner friends too! A band plays daily and with good music, good food and good company, you really should give Beer Market a try. Oh, I haven’t mentioned the fluctuating live prices of beer there (based on demand and supply) but I want you to have fun checking it out as well as the other food items on their menu. I’m not a movie spoiler so the same applies in this inaugural food review. You can visit Beer Market website too. I was with Zacq and Issac and you can find out more about what they do by clicking on their names!